Oh man, where do I begin. These last 10 months have been my longest gap between long hikes since I started thru-hiking five years ago. I normally return in September and set off again in March or April. This year, I chose to work the whole school year (substitute teaching and nannying) and not leave til the end of June because I knew I’d be gone much of the next school year while I’m in Australia and New Zealand. I always enjoy my time in Portland when I’m home and I’m very fortunate to have the freedom of flexible jobs. I substitute teach daily and then nanny many nights each week. I quickly took to 60+hr work weeks working 6-7 days of the week. In addition to that, I did many local presentations on my hikes and wrote some online articles. With that kind of schedule, the weeks went by pretty quickly, and before I knew it, spring had arrived and it was time to focus on this upcoming year of hiking. I usually do a lot more pre-hike posts, but I just ran out of time this year, so I apologize for less pre-hike content. It took a lot of time and energy to get the blog migrated over to this new platform and I’m really excited about it. There are some growing pains to be had and I appreciate your patience as things are tweaked and adjusted to give both you and myself the best experience possible. I appreciate the feedback, and most of you know I am a perfectionist with a focus on the details, so I like knowing where improvements can be made. Most importantly, I want to mention that the comments are now preset to only get replies to your own comment(you can modify that if you wish to have something different), so you will NOT get a notification each time someone comments, unless they are replying directly to your comment. I love that feature on blogs and was really excited to move away from Disqus and onto a platform where readers can comment more easily. Even if I don’t reply to all the comments, know that I read and appreciate each one. One other housekeeping item I’d like to mention is that if you follow my Walking With Wired Facebook page, I will be closing that one soon and I’ve now opened up a profile under “Wired Walks”….well, it currently says “Wired Hikes” because I somehow changed it in a sleep deprived moment without realizing I’d accidentally typed Hikes instead of Walks. In 60 days, I’ll be able to change it back, and yes, it will bug me everyday until those 60 days have passed. So anyone wishing to be friends on Facebook, go ahead and friend me at Wired Hikes(soon to be Walks, ugh!). So now on to the current fun stuff. 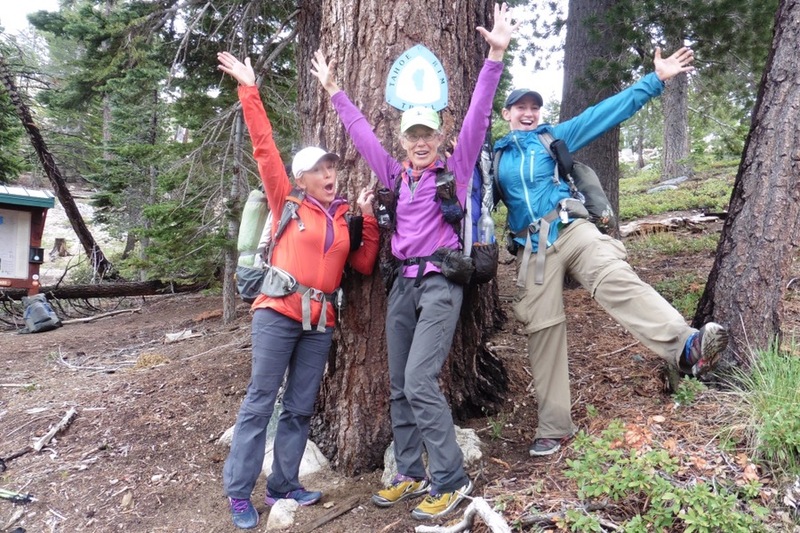 I’m just 6 days away from starting the Sierra High Route with Rockin’ and Why Not! 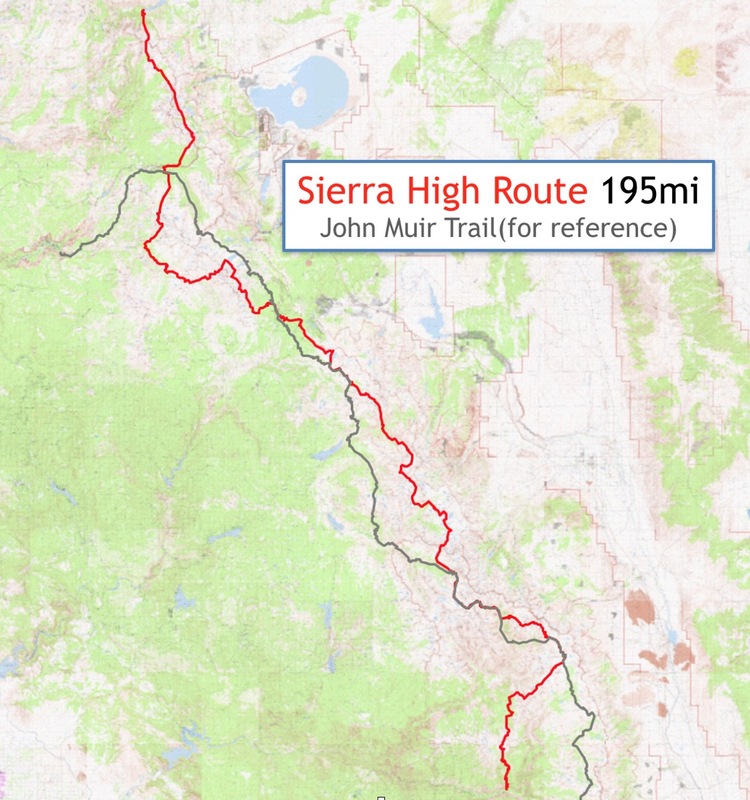 Most are familiar with the John Muir Trail in the Sierra Mountains of California. The SHR is basically the high elevation big sister of the JMT with far less trail to hike along. I’ve included the JMT on the map here for reference of where the SHR goes. Note that the SHR is a route, meaning that much of the hike (~100mi) is cross country over talus, boulders, and alpine meadows. The more arduous navigation and hiking pays off in the solitude that is found in such remote places. We are pretty stoked to have this trio reunite again this summer and I’m pretty sure no matter what happens, we are going to have a great time! I love hiking with these two. Rockin’, Why Not, and myself on the Tahoe Rim Trail last summer. It’s an average snow year this year, and we are getting out there a bit early, so we are sure to be in a lot of snow. Despite the added weight for snow gear, (we will be using microspikes and ice axes), we are pretty excited about having snow in the Sierra. The hope is that the snow will allow us to skim over some of that tedious talus that my weak ankles actually fear. I don’t use the term adventure too often, but it seems fitting for this one! The majority of the route is between 10,000-12,000ft. Rockin’ was just out there this past week conquering the peaks of Banner and Ritter. 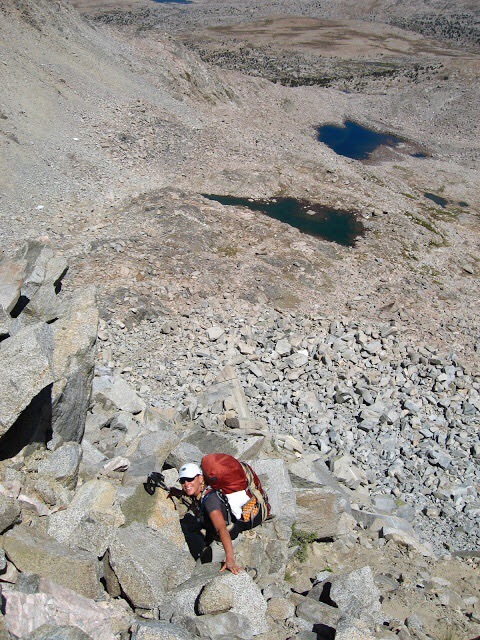 Check out this photo her son, Silly Chili took this week of Rockin’ and her husband Dan going up Ritter. Rockin’ will soon be posting the full report on this trip on her site, Lady on A Rock, with more amazing photos! Yep, that’s what we’re headed into! Mileages will be significantly lower (10-15mi/day) given the terrain and strenuous elevation gain/loss. Hope you enjoy the journey as this is the first of three high routes (SHR, Wind River High Route, and Kings Canyon High Basin Route) I’ll be doing this summer. I leave in a day to head to Big Sur to visit friends for a couple days before the hike. I hope to get some time to send out a couple more posts before we start on June 22nd. It’s all just now starting to sink in that this is really happening now that the resupplies have been sent. If you’re interested in seeing more detail on the SHR route, I have a live and interactive map that has the SHR along with an elevation profile that slides along the route in a really cool way. Each night, our location will be marked on that map an you can see what we did for each day. Ok, that’s it for now, next post will be from an oceanside view on Big Sur. Not a bad way to kick things off! I am currently working on how to love the natural beauty of Southern Illinois. But I can’t help wishing I could go to Big Sur! And the High Sierra! Take care, Erin, and happy trails! Well, Garden of the Gods should help with that appreciate I hope! Schrauf, there are quite a few triple crowners in Portland (thru-hiker mecca it seems), but that was totally me! My hair was much longer as I tend to only cut it once a year before I set out to hike and it’s been a long gap. You live in a great neighborhood. I look forward every summer to your adventures. You never disappoint. I can’t believe it’s already time!! I’m looking forward to our trip. The Sierra is the best. Hi Erin, I can’t wait to read your daily blog to Barry while he recuperates! Soon he will be reading them himself!! Travel safe and happy trails!! Too cool. Be safe and thank you for the time you take to post. Glad you are about to embark again on long trails and adventures. Have a great time; you work very hard and you deserve it! Have a great time Wired! I love “walking” with you. Hi Erin-Wired. Countdown time! I’m visualizing you being “one with fun” and feeling the support of the earth beneath your feet. Take lots of photos! Welcome back Erin! And best of luck on the high route, that looks like a *proper* walk to me 🙂 – none of your “traipsing through the woods from town to town” walking here! I will greatly welcome that traipsing once I get to the Bibbulmun in Australia. I don’t even think this one will allow for audiobooks or multitasking while I walk (crawl). Hope you have a great time! We’re still in baby watch mode here– I’ll keep you posted. I love reading your posts and all the awesome pictures. You should publish a pictorial book of all hikes! Although I know you enjoy it and we all live vicariously through your posts– I still worry about you while you’re out… Be safe and have a wonderful time. Hey Paula! I need to sometime show you the personal photo books I’ve made on Shutterfly for each trip. I love them! So great to see you commenting and that little guy should be coming any moment. So exciting! So happy it’s the season for Wired hiking again! I love living vicariously through your posts. Have a great time on the SHR! Good luck on your adventure Erin. 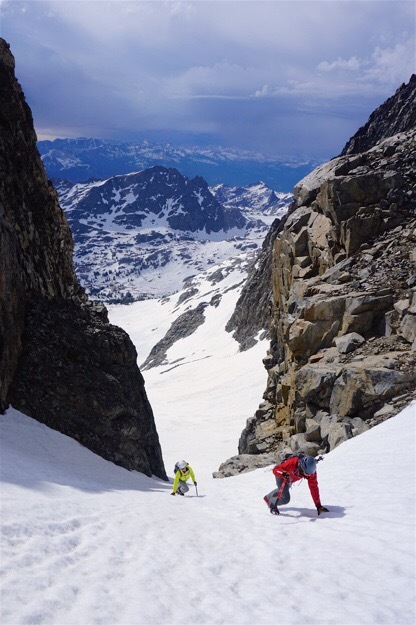 You are going to love the Sierra High Route. I’ve only done sections of it but it’s a wonderful route finding adventure. Maybe I’ll follow your footprints in a few years with a “continuous” thru-hike of this one. Looking forward to your posts. And I’m sure you will love the La Sportiva’s. My favorite brand! Oh this route and the other high routes are right up your alley Papa Smurf!